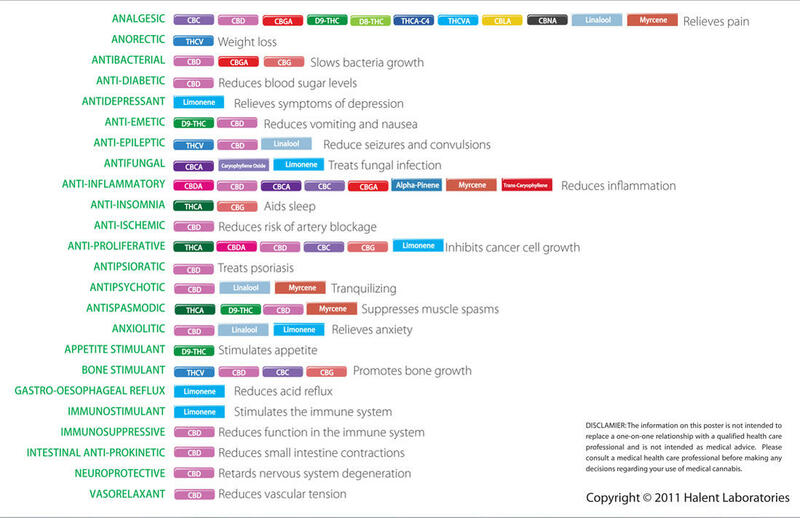 See an updated version of this post on The Leaf Online,Cannabinoid Profile – THCv! THCv is a non-psychoactive variant of THC. The other major difference between the two is that instead of stimulating appetite, the famed ‘munchies,’ THCv actually suppresses appetite. For that reason THCv is being heavily researched as a weight loss tool. Like many cannabinoids it is an anti-inflammatory and an analgesic, though less strong than CBD and THC, but using different mechanisms in the body. Diabetes: A combination CDB/THCv tincture is in a phase 2 clinical trial as a way to mitigate diabetes. GW Pharmaceuticals, a British company, is a world leader in cannabis research. GW is presently examining CBD/THCv’s abilities to ameliorate insulin sensitivity. Weight Loss: The same mechanisms that allow THCv to combat diabetes combined with THCv’s anorectic properties make it an effective way to combat obesity and control weight gain. GW Pharmaceuticals is also leading this research. GW believes in THCv so much they have even patented its abilities to combat weight gaining and diabetes. Parkinson’s Disease: THCv is a cannabinoid that has been identified that can aid in Parkinson’s Disease by attenuating the motor inhibition caused by 6-hydroxydopamine. It also has various related mechanisms that assist in treating Parkinson’s. Anti-Inflammatory: This study was only done on mice but if other studies are any indication of success it should apply similarly to humans, but THCv shows to be an anti-inflammatory. It works through a different mechanism than other anti-inflammatory drugs, THCv inhibits cyclic AMP production by hCB(2) CHO cells, but does not inhibit other affiliated cells. The whole thing seemed to rely on the CB 2 receptors. I do not even understand how I finished up here, however I believed this submit was once great. Thanks for the compliment, glad you liked the post!